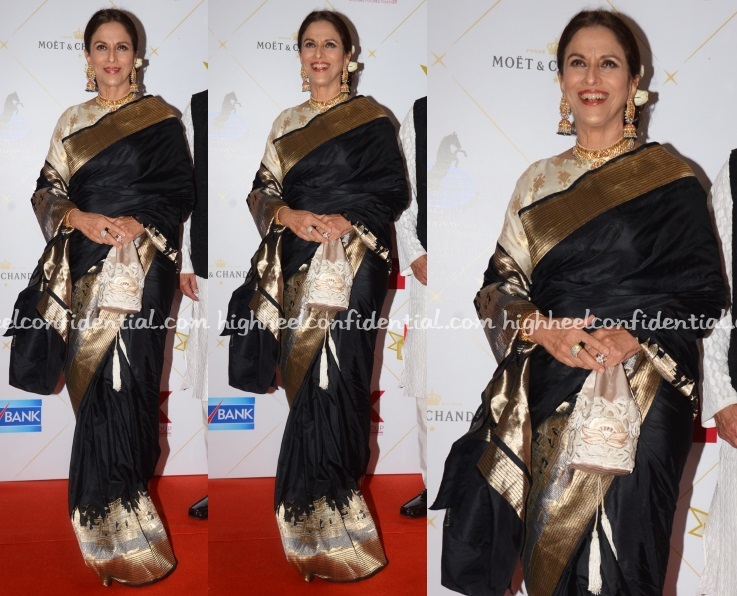 Shobhaa attended the Hello! Hall of Fame Awards on Sunday evening wearing a black sari by Tilfi, one that has been on my lust list forever. Why? Because, it features the ghats of Benaras on its border. And because of that, I wish she had worn the sari with the pally down so that one could’ve had a better look at the sari itself. At the Hello! awards held recently, Asha was photographed in a Lia Stublla gown. Retro-inspired wavy hair and pair of metallic ankle-strap sandals rounded out her look. The puckering at the hem was a downer. But it doesn’t take away from the fact that she looked good on the red carpet!